The plugin install script requires direct Internet access to download and install X-Pack. If your Logstash node doesn’t have Internet access, manually download and install X-Pack. Configure your Logstash nodes to send metrics to your production Elasticsearch cluster using the logstash.yml file. 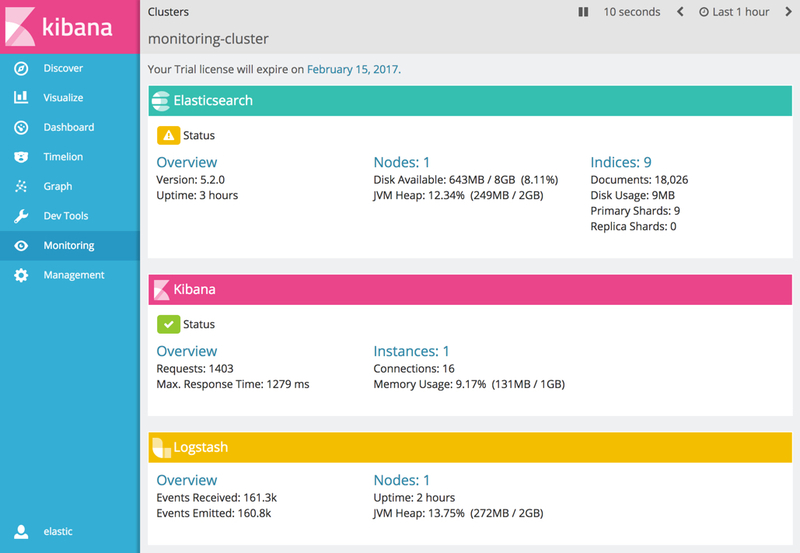 For more information about configuring your production Elasticsearch cluster for monitoring, see Setting up a Separate Monitoring Cluster. If SSL/TLS is enabled on the production cluster, you must connect through HTTPS. If multiple URLs are specified, Logstash can round-robin requests to these production nodes. The logstash_system user is automatically added when you install X-Pack. Don’t forget to change the default passwords for all of the built in users. If X-Pack security is disabled on the production cluster, you can omit the username and password for the agent. If SSL/TLS is enabled on the production Elasticsearch cluster, specify the trusted CA certificate(s) that will be used to verify the identity of the nodes in the cluster. To verify your X-Pack monitoring configuration, point your web browser at your Kibana host, and select Monitoring from the side navigation. Metrics reported from your Logstash nodes should be visible in the Logstash section. When security is enabled, to view the monitoring dashboards you must log in to Kibana as a user who has the kibana_user and monitoring_user roles. When upgrading from older versions of X-Pack, the built-in logstash_system user is disabled for security reasons. To resume monitoring, change the password and re-enable the logstash_system user.